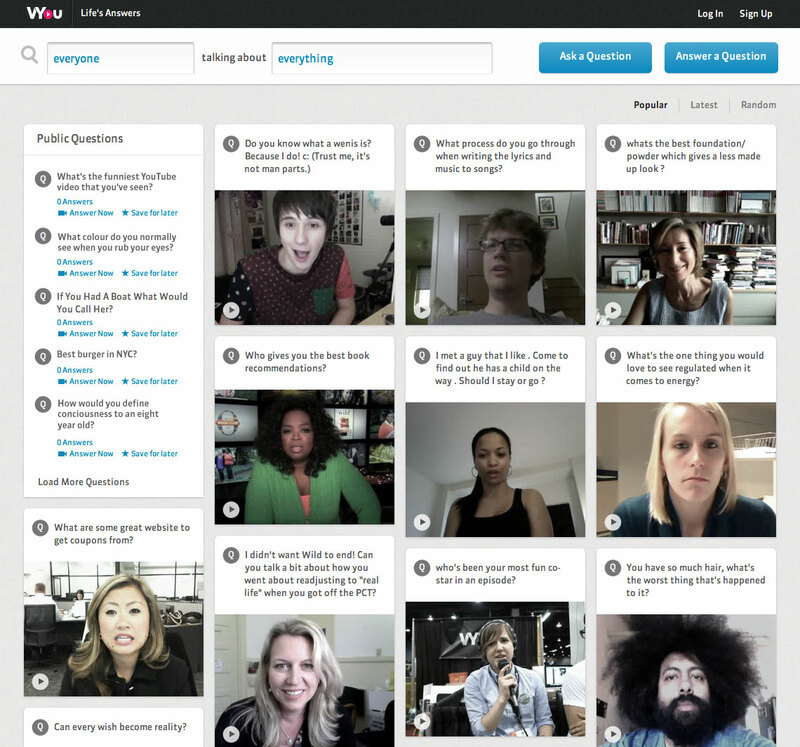 VYou launched a year and a half ago to let users ask each other questions, with answers posted by video. Since then, it’s and rolled out an iPhone app for answering questions on the go and attracted a fair number of celebrities to answer questions through its platform. (Hello, Oprah!) It’s also received more than a million video responses to date. VYou’s been great at building its community to date and letting users interact with each other. Users could see a feed of videos from the people they were following, ask and answer questions of each other and the like. The thing it’s not been so great at is helping users to search the whole site’s content and find interesting users or groups of users they might not know about. With that in mind, VYou just launched a major site overhaul designed to make it easier for users to find users and answers to interesting questions. One of the ways that VYou is doing that is by showcasing popular videos on the home screen. So you’ve got the obvious celebrity contributions (Hello Oprah on my home screen! ), as well as those that the community found interesting. There’s also a running feed of public questions on the left side of the screen, letting anyone jump in and answer. VYou has also redefined its search functionality in a big way. For one thing, there’s a big old search function at the top of the screen, letting you search for answers from individual users (or groups! ), and refine the search by topic. So if you searched for “Deepak Chopra talking about love” you’re met with a whole wall of videos with him talking about that. It also works for groups, so you can do a search of NYC Ballet Dancers, for instance. Or if you just wanted to know what the whole community thinks about a certain subject, you could just search for it, leaving it open the everyone. In addition to searching for content by group, users will now be able to ask questions of a group. So rather than asking a ballet-related question to the global community, you can pose the question just to members of that group. VYou founder Steve Spurgat tells me that the site has pretty high engagement and a good return rate for users, but that most viewers will get stuck on a single user’s page and just watch multiple answers from that one user. The new design, and the groupings of users are meant to help nudge them to check out other users. Speaking of, have we mentioned Oprah? Other celebrities to recently join include TechCrunch nemesis Arianna Huffington, designer Nicole Miller, author Cheryl Strayed, Senator Chuck Grassley, and Congressman Keith Ellison. VYou has raised $3 million in funding from RRE Ventures, Highland Capital Partners, High Peaks Ventures, Broadway Video Ventures, Kevin Wall, David Tisch, and Rick Webb. The company, which is based in New York City, now has 12 employees.